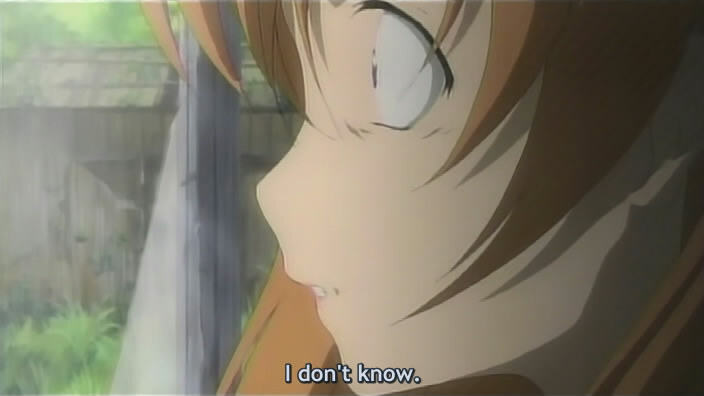 Higurashi no Naku Koro Ni Kai 1 – Will the Mysteries Finally be Solved? 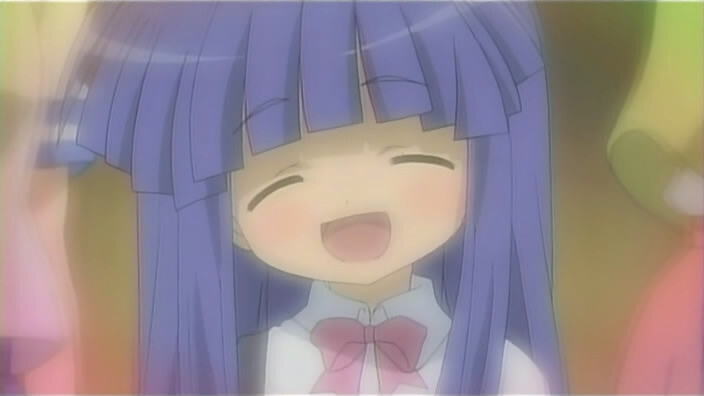 The show I’ve been most looking forward to this season, Higurashi Kai, is finally out on fansub. Higurashi won my “Originality Award” last year along with Haruhi Suzumiya for taking two hackneyed genres–harem and haunted village horror–and creating a harrowing, postmodern set of short stories about what drives people not only to do but to become evil. Though it sometimes lurched into outlandish plot twists, and much was left unexplained at the end of the first season, it was still one of 2006’s most substantial and dramatically compelling shows. It forced the viewer to empathize with and understand characters who do horrific things. No small feat for a show that features such obvious harem lolis. So when I heard that they were going to devote the second season not only to new material, but to provide answers to some of the puzzling turns that happened at the end of the first season–I was excited. And they have delivered in this episode, which by all rights ought to have been in the first season. It provides an epilogue to the events and purported happenings of the first season’s final “Atonement’ arc, though substantial clues are thrown out for future exploration, like the identity of Rika. In fact, if the OP is any clue, she is going to be a very prominent part of this season. This episode already hints strongly at who she might be. 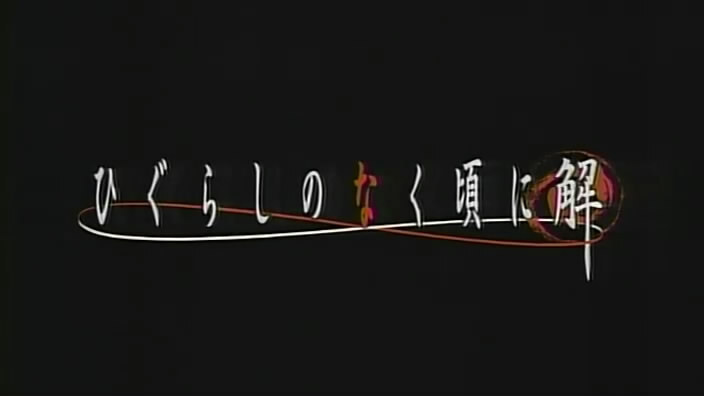 The mood of the show, judging from the OP and the episode itself, seems more melancholy than sadistic and creepy. The centerpiece of the episode is a broken adult Rena, who after 2 decades has yet to recover psychologically from whatever happened in the Great Hinamizawa Disaster. (The writers are clearly trying to find a way to relate all the arcs in season 1 in some way.) Even when Ooishi, unfairly, pushes her to try to remember and she gets angry–it is not the crazed, vengeance-filled berserker mode we saw in Season 1. It’s a heartbreaking helplessness instead. Knowing the final outcome of the town–everyone but Kei-chan and Rena dies–frees the show to focus on character and not rely too much on suspense and shock. We are going to be treated to the why more than the what behind the town’s secret tragedies, and see for ourselves just how a town can be literally cursed unto death in both body and spirit. The show’s strength is in how it shows that this curse is at once both outside and inside the townspeople, something that has a malignant power of its own but seems also to come naturally from the fears and desires of the people. Nobody is merely a victim; everyone is in some way personally responsible. The stories of the characters trying to deal with the curse of Oyashiro-sama is thus always a story about the inner struggles of the characters and whether they choose to resist or give in to the beast that is, first and foremost, always inside and part of themselves. No episode preview? I loved the episode previews in season 1. They were arty and actually good foreshadowings of the themes of the next episode, with some lovely music too. The OP song, while good and by the same artist, is not as instantly memorable as the first season’s. The graphics are also more generic than the juxtaposition of cute and disturbing the first one did so well. Previous PostAX Video Diary: OuttakesNext PostRay’s poll is up.